Chubb can cover almost all of the classic and antique cars, trucks, tractors, fire trucks and even military vehicles. Provides comprehensive professional liability coverage for architects, engineers, and surveyors with the expertise to understand a firm's needs and the authority to get the job done. While real estate professionals may be committed to their clients, clients may not always return the favor. No matter the size of a real estate business it can face potential exposures as client expectations are increasing and lawsuits are becoming more common. It is important to protect the business' financial security during a lawsuit or claim. That is why Travelers 1st Choice+® is specifically designed to offer protection to real estate professionals for the array of emerging exposures they face and can help protect the real estate firm against losses resulting from negligence, errors, and omissions in the performance of professional services. And this errors and omissions policy can be tailored to fit the business' needs. 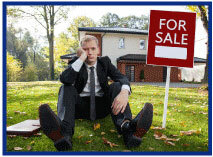 Need Realtor® prospects or contact information for a Realtor you know? Try the "Find a Realtor" feature. Call five a day and you'll be homing in on sales in no time! Coverage is available in all states with the exception of CA, HI, and LA and is written on admitted paper. Log in to Big "I" Markets at www.bigimarkets.com and click on Real Estate Agents and Property Manager E&O to learn more or to request a quote. The number of states legalizing the growth, distribution and possession of marijuana, in one form or another, continues to increase. 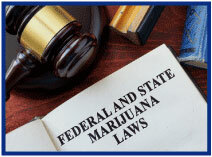 As of this writing, twenty-eight states and the District of Columbia have legalized the use of medical marijuana; eight states and the District of Columbia have legalized the use of recreational marijuana. The cannabis market is a multi-billion dollar industry, with revenue expected to reach $20 billion by 2021. It is important to remember, the fact is that the growth, distribution or possession of marijuana is a crime under federal law. As with any other business, those involved in the industry are seeking insurance coverage for their assets and potential liabilities, and the opportunities for carriers, brokers and agents may seem endless. To continue on to the full article click here. Log into the Big "I" Professional Liability Risk Management Web site, EOHappens at www.iiaba.net/EOHappens to access more Big "I" member-exclusive content for your agency. Julie Carter is an assistant vice president, claims specialist with Swiss Re Corporate Solutions and works out of the office in Overland Park, Kansas. Insurance products underwritten by Westport Insurance Corporation, Overland Park, Kansas, a member of Swiss Re Corporate Solutions. High-net worth people may maintain residences around the world. There are many reasons to do this. Some do it as a real estate investment. Others vacation or do business in foreign countries and prefer a place of their own over a hotel. These places need to be furnished and maintained and that can mean a fairly large investment alone, especially in some of the world's great shopping areas. Even if a piece is purchased to bring back to the U.S., there may be export problems, which might mean an expensive piece must remain behind or be seized. Another consideration is liability issues. If your client has an auto accident in Europe, what happens next depends on in which country it takes place. Having someone to rely on that understands the complexities of world travelling high-net worth individuals and families can put their minds at ease. AIG's Private Client Program and is available to registered members in all states. 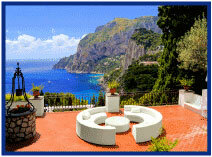 Travel over to Big "I" Markets and click on Affluent Program - New Business to learn more! Don't miss the following education opportunities provided from the Big "I" Virtual University experts that focus on topics agents need to know to make a smart start in 2017. For more information, contact national staff. Other topics in the 2017 schedule cover partial losses, contractual risk transfer, business income, contractors and more. The entire schedule, including registration links can be found online here. Wednesday, June 14 - 1:00 - 3:00pm EDT. "Untangling the Work Comp Mess - When Employees Travel and Their Families Sue". When employees travel out of state for work, real work comp coverage gaps can exist; and these gaps could leave the employer without the necessary protection they THOUGHT they purchased when they paid their work comp premiums. Extraterritoriality and reciprocity are major work comp problems most agents don't know they have. Yes, every state provides extraterritorial work comp protection, but not every state recognizes that coverage – so many insureds are unknowingly blindsided by uncovered or improperly covered claims. Recently I received the 1Q results for our fair industry as summarized by ALIRT Insurance Research. "1Q" being finance-speak for the first quarter of the year. I was jarred by the accident year combined ratio: One-O-Six (106%). The folks at ALIRT use a basket of insurers they follow closely to make these quick assessments as we go through the year. At Big I Advantage® we use ALIRT to help us track both the insurers we are appointed with and the industry in general. Oh, they attributed the results to "very high catastrophe losses from severe thunderstorm and convective weather events in March especially." Convective Events are also known as big thunderstorms and resulting hail and tornados. Anyway, losing 6 cents on each premium dollar when interest rates are low is sure to get the attention of insurer CEOs. To give you some sense of 106, I stripped out the approximate 28% expense ratio to get to the 78.1% accident year loss ratio. 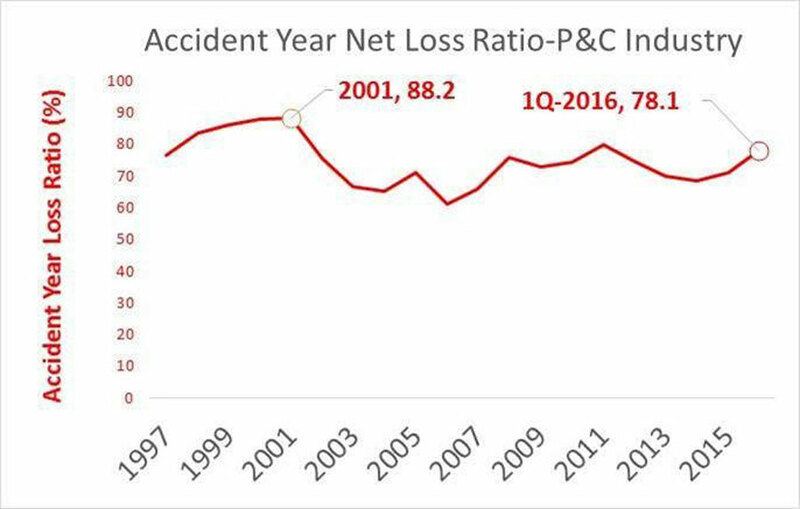 Then I juxtaposed the Accident Year Loss Ratio equivalent to that 106 "combined" with industry accident year loss data back to 1997. As you can see even our first quarter of 2017 is still 10 points below the industry results in 2001 but it's above most years in recent past and, of course, a quarter doesn't make a year. Why are Accident Year Loss Ratios the "cool kids" at insurance school? Because they tell you the grittier version of the story than what you often get…unfiltered from generalizations from parental-like accountants. There is no including distracting loss reserve changes from past years in these. 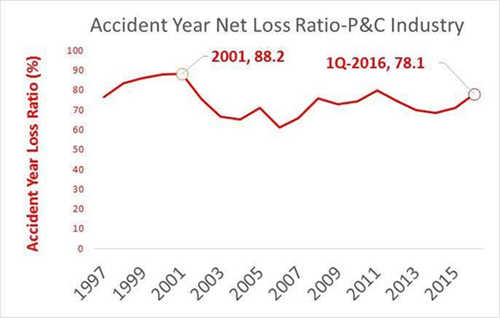 Unlike Calendar Year Loss Ratios, Accident Year Loss Ratios are closer to the "feeling" of a year with losses matched most closely to the premiums during the same time period. If you want the full ALIRT report for 1Q, email me and I'll send it your way. Congratulations to our agent in Washington on an Affluent Homeowner sale of $35,997 in premium!